Rye is a small town and civil parish in the Rother district, in East Sussex, England, two miles from the sea at the confluence of three rivers: the Rother, the Tillingham and the Brede. In medieval times, as an important member of the Cinque Ports confederation, it was at the head of an embayment of the English Channel, and almost entirely surrounded by the sea. At the 2011 census, Rye had a population of 4,773. Its historical association with the sea has included providing ships for the service of the King in time of war, and being involved in smuggling. The notorious Hawkhurst Gang used its ancient inns The Mermaid Inn and The Olde Bell Inn, which are said to be connected to each other by a secret passageway. Those historic roots and its charm make it a tourist destination, with hotels, guest houses, B&Bs, tea rooms, and restaurants. It has a small fishing fleet, and Rye Harbour has facilities for yachts and other vessels. The name of Rye is believed to come from rie, meaning a bank[dubious – discuss]. Medieval maps show that Rye was originally located on a huge embayment of the English Channel called the Rye Camber, which provided a safe anchorage and harbour. Probably as early as Roman times, Rye was important as a place of shipment and storage of iron from the Wealden iron industry. The Mermaid Inn originally dates to 1156. 1899 sketch of John Breads's Gibbet Iron, Rye, East Sussex. 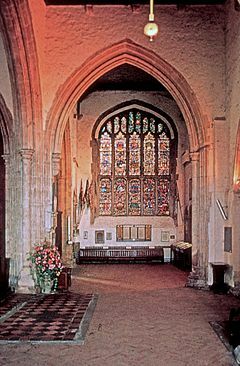 Rye, as part of the Saxon Manor of Rameslie, was given to the Benedictine Abbey of Fécamp in Normandy by King Æthelred; it was to remain in Norman hands until 1247. As one of the two "Antient Townes" (Winchelsea being the other), Rye was to become a limb of the Cinque Ports Confederation by 1189, and subsequently a full member. The protection of the town as one of the Cinque Ports was very important, due to the commerce that trading brought. One of the oldest buildings in Rye is Ypres Tower, which was built in 1249 as "Baddings Tower", to defend the town from the French, and was later named after its owner, John de Ypres. 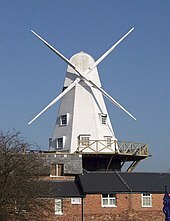 It is now part of the Rye Museum. Rye received its charter from King Edward I in 1289, and acquired privileges and tax exemptions in return for ship-service for the crown. The "Landgate" (the only surviving one of four original fortified entrances to Rye) dates from 1329 in the early years of the reign of King Edward III. It is still the only vehicular route into the medieval centre of Rye and is suitable only for light vehicles. In 2015, some 25 tonnes of pigeon excrement that had built up had to be removed from Landgate Arch for fear of damaging the ancient structure. The River Rother originally took an easterly course to flow into the sea near what is now New Romney. However, the violent storms in the 13th century (particularly in 1250 and 1287) cut the town off from the sea, destroyed Old Winchelsea, and changed the course of the Rother. Then the sea and the river combined in about 1375 to destroy the eastern part of the town and ships began use the current area (the Strand) to unload their cargoes. Two years later, the town was sacked and burnt by the French, and it was ordered that the town walls be completed, as a defence against foreign raiders. Rye was considered one of the finest of the Cinque Ports, though constant work had to be done to stop the gradual silting up of the river and the harbour. Also, a conflict arose between the maritime interests and the landowners, who gradually "inned" or reclaimed land from the sea on Romney and Walland Marsh, and thus reduced the tidal flows that were supposed to keep the harbour free of silt. Acts of Parliament had to be passed to enable the Rother to be kept navigable at all. With the coming of bigger ships and larger deepwater ports, Rye's economy began to decline, and fishing and particularly smuggling (including owling, the smuggling of wool) became more important. Imposition of taxes on goods had encouraged smuggling since 1301, but by the end of the 17th century, it became widespread throughout Kent and Sussex, with wool being the largest commodity. When luxury goods were also added, smuggling became a criminal pursuit, and groups – such as the Hawkhurst Gang who met in The Mermaid Inn in Rye – turned to murder and were subsequently hanged. Since 1803, lifeboats have been stationed at Rye although the lifeboat station is now at Rye Harbour about 2 miles (3.2 km) downriver from the town. The worst disaster in RNLI history concerning a single vessel, and indeed in the 20th century, occurred in 1928, when the Mary Stanford sank with all hands. The incident is recorded by a tablet at Winchelsea church, by the imposing memorial at Rye Harbour Church and by the folk song "The Mary Stanford of Rye". A new Mary Stanford was commissioned by the RNLI two years later, and stationed at Ballycotton on the coast of Ireland. Since 2010, the RNLI has operated an Atlantic 85-class inshore lifeboat at Rye Harbour. Between 1696 and 1948, six ships of the Royal Navy have borne the name HMS Rye. During the 1803–1805 Napoleonic invasion threat, Rye, Dover, and Chatham were regarded as the three most likely invasion ports, and Rye became the western command centre for the Royal Military Canal. The canal was planned from Pett Level to Hythe, but was not completed until long after the threat had passed. From 1838–1889, Rye had its own borough police force. It was a small force, often with just two officers. Rye police frequently had difficulties on Bonfire night (5 November) and special constables were recruited to help deal with the problems bonfire gangs caused. After amalgamation with the County Force in 1889 a new police station was provided in Church Square. In 1892 the strength of the town police, now amalgamated, was one sergeant and three constables. In May 1940, during the darkest days of World War II, the Rye fishing fleet was invited to participate in Operation Dynamo, the seaborne rescue of the stranded British Expeditionary Force at Dunkirk, but refused to do so. Paul Monod's book The Murder of Mr Grebell: Madness and Civility in an English Town (2003) begins with the murder of a justice of the peace in Rye in 1743, considering its background as far back as the Reformation, then looks at events in the town over the next 200 years. Walking Tour of Rye, the most beautiful town in England, by Jonathan Copeland, ISBN 9781301139996, describes every important building, explains it, and puts it into historical context. Many photographs illustrate the book. Rye, being part of the Cinque Ports Confederation and a bastion against invasion on the Channel Coast, has always had close links with the crown. King Edward III and the Black Prince defeated the Spanish in Rye Bay in 1350 in the battle of Les Espagnols sur Mer, but Queen Elizabeth I gave the town the right to use the title "Rye Royal" following a visit in 1573. King Charles I described Rye as "The cheapest sea-towne for the provision of fish for our house". 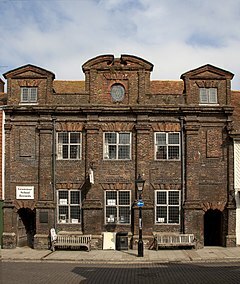 George I whilst returning from visiting his continental possessions in 1726 was grounded on Camber Sands and spent the next four days in Rye, being accommodated at Lamb House. Historically, Rye was an independent borough granted rights of governance under its charter of 1289, with its own appointed mayor and chosen jurats (magistrates). These independent powers were terminated by the Local Government Act of 1973 and, although officially considered to be a civil parish, Rye's governing body – because of its history – is that of a Town Council. That Council has one electoral ward, electing 16 members, one of whom then is elected mayor of Rye. In the Townhall the list of the mayors of Rye is unbroken going back to the 13th century. Two gruesome relics of Rye's violent past include the gibbet cage which was famously used to display the hanged body of the murderer John Breads in 1742, and the pillory last used in 1813 in the case of a local publican who assisted the escape of the French General Phillipon. The current mayor (2016) is Cllr Jonathan Breeds. Apart from the Town Council, local government is exercised by Rother District Council (RDC), with its headquarters in Bexhill-on-Sea, and East Sussex County Council, based in Lewes. The Rye ward returns two councillors to RDC. Since 1983, Rye has been part of the parliamentary constituency of Hastings and Rye, prior to which it had its own seat. The current Member of Parliament is Amber Rudd of the Conservative Party. Rye stands at the point where the sandstone high land of the Weald reaches the coast. The medieval coastline (see map above), with its large bay, enabled ships to come up to the port. The original course of the River Rother then reached the sea at Romney to the northeast. Storms in the English Channel in the 13th century, coupled with reclamation of the bay, brought huge quantities of gravel through longshore drift along the coast, blocking the port entrance. The course of the river has also changed over the centuries so that Rye now stands on the river at the point of its confluence with the River Tillingham and the River Brede, whereas the river flows southward into Rye Bay. River Rother and the environs of Rye Harbour are managed and maintained by the Environment Agency. The Rivers Brede and Rother also form part of the Royal Military Canal between Winchelsea and Iden Lock. 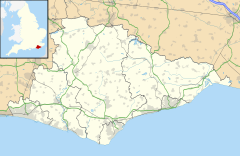 The town is part of the remotest and least populated area of southeastern England, on the edge of Romney Marsh and within 3 km of the coast. A part of the town, but only a minority of the housing stock, lies on the original rocky heights (the Citadel) and contains the historic buildings including St Mary's parish church, the Ypres Tower (part of the Town Wall), Lamb House and many of the houses on Mermaid Street, Watchbell Street, and Church Square. The main road skirts the town to the south after crossing the river; Winchelsea Road leads to New Winchelsea Road, formerly Royal Military Road, which runs parallel to the River Brede before leaving the town boundary. The houses along New Winchelsea Road date from the 1930s, built on the excavations from the Royal Military Canal. The gardens run down to the river, with fishing and boating rights. Most of Rye's inhabitants live outside the Citadel area. Rye, over the centuries, has successively been an entrepôt port, a naval base, a fishing port, an agricultural centre, and a market town. Rye depends on its tourist appeal, which attracts traffic from all over the world. The old part of the town within the former town walls has shops, art galleries and restaurants. Since the second world war, the town has become a centre for ceramics. Apart from its tourist base, Rye continues to operate as a port. Considerable investment has been made in facilities for both the fishing fleet berthed at Rye and the commercial wharves at Rye Harbour. Rye fishing boats are code-lettered RX (from "R"ye, Susse"x"; this registration is also used by the Hastings fishing fleet) and land fish daily. Some of the catch is sold at the quayside, though most is sold through the great regional market in Boulogne. At Rye Harbour, the Rastrums Wharf (which was renovated in the 1980s) has the capacity to take large ships up to 80 metres (260 ft) on a high tide. Rye also is an important yachting base, offering the only safe haven for many miles in either direction along this section of Channel coast. Yachts may currently moor either at Rye Harbour or at the Strand Quay at the edge of the town. Numerous plans have been proposed for a modern yacht marina to be built at Rye, but each has foundered on economic or planning grounds. At the latter end of the 18th century, Rye was connected to the Turnpike Trust system of roads. 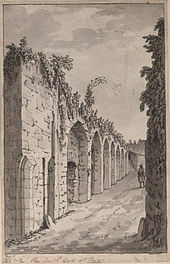 One of these, the Flimwell Turnpike, took passengers towards London; the second ran from Hastings eastwards through the town. These two roads are now the A268 and the A259. The Monk Bretton Bridge over the Rother was built in 1893 and provided a link with Rye and New Romney via Brenzett. In the 1980s and 1990s, proposals to bypass the A259 route around Rye were met with local opposition and never received any priority in the building programme. In addition to the half-hourly 100/101 Dover-Hastings Stagecoach long-distance bus service, buses connect Rye with other towns and villages, including Tenterden, Hastings, and Tunbridge Wells. Rye railway station is on the Marshlink line between Hastings and Ashford. This now provides an hourly service from Brighton to Ashford International connecting with Eurostar services to Paris Gare du Nord and the high-speed Class 395 service to London St Pancras. Gatwick Airport may be reached by rail via Eastbourne or Lewes. Before World War II, summer steamship service ran from Rye to Boulogne. Rye was also the terminus for the prewar Rye & Camber Tramway, built to serve golf courses and Camber Sands, closed to the public at the outbreak of World War II, never reopened, and scrapped in 1947. Several long-distance footpaths can be joined by walkers in the town. The Saxon Shore Way which starts at Gravesend, Kent, and traces the coast as it was in Roman times, passes through Rye en route to Hastings; the 1066 Country Walk leads from Rye to Pevensey; the High Weald Landscape Trail goes to Horsham; and the Royal Military Canal Path follows that waterway to Hythe. Rye College (formerly called Thomas Peacocke Community College, and before that Thomas Peacocke School) is a secondary school in Rye. Rye Studio School opened in September 2013 for 14- to 19-year-olds. The two primary schools, Tilling Green Infant School and Freda Gardham Community School, were replaced by a new school, Rye Primary, adjacent to the secondary institution, in September 2008. The original Rye Primary School was situated just off Ferry Road near the railway crossing. Past and present places of worship in Rye include St Mary's, the Anglican parish church with Norman origins; St Anthony of Padua Roman Catholic church, rebuilt in 1929; a 1909 Baptist chapel in Cinque Ports Street, replacing the Rye Particular Baptist Chapel of 1754 (which itself stood on the site of an older Quaker meeting house); former Congregational and Independent churches; and a Methodist chapel. Rye is a local commercial centre for the Romney Marsh and Walland Marsh areas, as well as being a tourist spot. Rye Farmers' Market takes place on Strand Quay every Thursday morning. Rye has a well-established reputation as a centre for shops trading antiques, collectors' books, and records, and has many art galleries selling works by local artists and potters with changing exhibitions throughout the year. Rye's general weekly market takes place on the marketplace car park by the station every Thursday. Until the foot-and-mouth disease crisis in 2001 (which closed all livestock markets in England), livestock sales were held frequently at Rye. Rye Castle Museum is located on two sites, on East Street and at the Ypres Castle. One of the tourist websites includes a picture tour of the town Rye Art Gallery was established as a Trust in the early 1960s. Located at 107 High Street, it provides a focus for contemporary visual art, which it exhibits alongside heritage artworks from its permanent collection. Rye also stands at the centre of a network of nature reserves, some of national importance. The Rye Harbour SSSI lies to the south and includes the Rye Harbour Nature Reserve. The neighbouring Pett Levels and Pools, and the Pannel Valley nature reserve are accessible via Winchelsea and Winchelsea Beach a few miles to the west, whilst Scotney Lake lies just off the Lydd road and the RSPB reserve at Dungeness lies a few miles further to the east with the Bird Observatory located in the old lighthouse. The recent redevelopment of the Rye wharf for the RX fishing fleet has provided modern amenities for the landing and storage of fish. Most is sold wholesale through the regional market in Boulogne, though there is a trend for Rye to develop as a gastronomic centre in the style of Newquay or Padstow, featuring the use of fresh local produce from the sea. The annual "Rye Bay Scallops Festival" which takes place each year in February was first proposed by the then Chair of the Chamber of Commerce, Kate Roy, as a means of promoting the "Rye Bay Catch". Excellent scallops (and flatfish such as sole, plaice and dabs) are to be had in Rye Bay because of the shallow and relatively sheltered water. Every year in September, Rye hosts its annual two-week "Arts Festival" which attracts a world-class series of performers in music, comedy, and literature. On the second Saturday after 5 November, the "Bonfire Boys" stage their annual torch-lit parade through the streets of the town, supported by visiting Bonfire Societies from all over the Sussex Bonfire Societies Confederation. This is followed by a "gurt 'normous bonfire" where the chosen "effigy" of the year is ceremoniously blown up, and a spectacular firework display. This event typically attracts over 10,000 visitors to the town, and results in the town's roads, and the main roads to London, Hastings, and Ashford, being clogged up and closed to traffic from the early evening onwards. Rye has a Non-League football club Rye Town F.C. who play at the Salts. The new club (formed 2016), which plays in the East Sussex Football League, replaced Rye United (formerly Rye & Iden United) of the Sussex County Football League, which folded in 2014. Rye has a rugby club (Rye RFC) who are in the Sussex intermediate league. The club was formed in 1991 and field both adult and youth teams. The rugby club and playing fields are located on New Road. Several mentions of the town have been made by famous travel writers between the 16th and 18th centuries, although not all mentions were good. Sir Robert Naunton (1563–1635) mentions it in his book Travels in England, published sometime between 1628 and 1632; he calls Rye a "small English seaport"; shortly after his arrival he takes post-horses for London, travelling via Flimwell. Daniel Defoe (1660–1731) describes the state of the harbour and its approaches, saying, "Rye would flourish again, if her harbour, which was once able to receive the royal navy, cou'd be restor'd … " but that he thought it very doubtful that large ships would be able to use the port again. William Cobbett (1763–1835) simply mentions it in passing, saying that this area (that including the Romney Marsh) would be most likely to be where the French invaders might land. According to Norman Wright's book "The Famous Five: Everything you ever wanted to know", it was Rye and the Romney Marsh that inspired Enid Blyton to write "Five go to Smuggler's Top" (1945). In 1969, Malcolm Saville published an entry in his Lone Pine series of children's adventure novels titled Rye Royal set largely in Rye, although he had previously based several others of the series wholly or partially in the town, starting with The Gay Dolphin Adventure published in 1945. The titular Gay Dolphin is a fictional hotel owned by the mother of one of the Lone Pine Club, but is located in the book seemingly in Watchbell Street, where the real Hope Anchor hotel stands, although its description in the books is more akin to the town's Mermaid hotel. Over the course of the books, several of the town's landmarks are mentioned and described accurately, as is some of its history. Rye has produced and attracted many fiction writers, some of whom lived at Lamb House, one of the town's historic residences and now owned by the National Trust They include Henry James (1843–1916), the American novelist, who was resident between 1898 and 1916; Joseph Conrad; Ford Madox Ford; Stephen Crane; H.G. Wells; Rumer Godden (1907–98), the Anglo-Indian novelist; and E.F. Benson (1867–1940), the English novelist. Both the house and the town feature prominently in Benson's Mapp and Lucia novels, as Mallards House and Tilling, respectively. In the mid-1980s, Rye was used as a filming location by LWT for its adaptation of the Mapp and Lucia novels. A BBC adaptation of Mapp and Lucia was filmed in Rye in the summer of 2014. The post-Monty Python film Yellowbeard also had a few scenes filmed on the cobbled street. John Christoper (Samuel Youd) wrote many of his novels including the Death of Grass whilst a resident, as did the popular children's author John Ryan, creator of the Captain Pugwash books and Sink Port is a thinly disguised fictional version of the town and pun on 'cinque port'. The feature film Captain Horatio Hornblower R.N. (1951) was filmed on Mermaid Street. It starred Gregory Peck. Mermaid Street serves as Hornblower's wife and mother's house in Portsmouth. Conrad Aiken (1889–1973), American writer: Aiken's former home, Jeake's House, is now a guest house. Geoffrey Bagley (1901–1992), Canadian war artist who settled in Rye post war and then worked to preserve the town's historic mementos and places. Tom Baker (born 1934), British actor, best known for playing the Doctor in Doctor Who 1974–1981. Viola Bayley (1911–1997), children’s writer of adventure stories. John Christopher (1922–2012), science fiction author. The 1980s British television series based on his trilogy, The Tripods, was filmed near his house. Monica Edwards (1912–1998), children's author who lived at Rye Harbour and set her Romney Marsh novels in the area, renaming Rye Dunsford. Sir Paul McCartney (born 1942), musician and former Beatle: McCartney's children attended the local schools in Rye. John Ryan (1921–2009), although born in Edinburgh, this British author/cartoonist famed for his TV cartoon Captain Pugwash, was a resident of Rye. Malcolm Saville (1901–1982), author of nearly 80 children's books, largely thrillers and adventure stories. Saville was the creator of the Lone Pine series of books, a number of which were set in Rye, including The Gay Dolphin Adventure and Rye Royal. Baron Saville of Newdigate (born 1936) chair of the "Bloody Sunday" enquiry and nephew of Malcolm Saville, attended Rye Grammar School (1947–1953). The new Rye Studio School's dance theatre is named after him. Admiral Sir Aubrey Smith (1872–1957) lived in Rye at Iden Cottage. Russell Thorndike (1885–1972) set his Dr Syn novels about smuggling on the marshes. Sir Anthony van Dyck (1599–1641) did several drawings of the town, unusually detailed for him, and probably done to pass the time until a ship to the continent arrived.. Some ancestors of Jamaican reggae artist Bob Marley (1945–1981) reportedly hail from Rye; his great-grandfather, Frederick, was born in the town in 1820. ^ a b "East Sussex in Figures". East Sussex County Council. Retrieved 26 April 2008. ^ "Rye (East Sussex, South East England, United Kingdom) - Population Statistics and Location in Maps and Charts". ^ "Visit Rye, East Sussex - Visit1066Country.com". ^ a b "Rye Castle Museum - 3 East Street and the Ypres Tower". ^ "Rye Harbour Lifeboat Station". ^ Dan Cruickshank (5 November 2009). "Napoleon, Nelson and the French Threat". BBC. Retrieved 7 March 2010. ^ "Rye Town Council : The Council". ryetowncouncil.gov.uk. ^ "Rye Town Council : Terms of Reference". ryetowncouncil.gov.uk. ^ "Rye Town Council : Town Hall". ryetowncouncil.gov.uk. ^ "New Rye mayor appointed during traditional ceremony". ryeandbattleobserver.co.uk. ^ "Rye Harbour" Archived 11 August 2009 at the Wayback Machine. Environment Agency. ^ Cooksey, Laurie. "The Monkbretton Road Bridge". Rye's Own. Retrieved 23 November 2017. ^ Nairn, Ian; Pevsner, Nikolaus (1965). The Buildings of England: Sussex. Harmondsworth: Penguin Books. p. 594. ISBN 0-14-071028-0. ^ Elleray, D. Robert (2004). Sussex Places of Worship. Worthing: Optimus Books. pp. 47–48. ISBN 0-9533132-7-1. ^ "Wild Rye - Discover Our Wetland Wildlife". ^ "Rye Bay Scallop Week - Sat 18th – Sun 26th Feb 2017". ^ "Rye & District Bonfire Society - Saturday 12 November 2016". ^ "Vision of Britain - Daniel Defoe - Letter 2, Part 2: Canterbury and Sussex". ^ “Writers in Rye”, Rye Castle Museum website, 20 October 2014. ^ "BBC One announces adaptation of EF Benson's Mapp And Lucia". BBC. 28 February 2014. Retrieved 4 April 2014. ^ "Geoffrey Bagley - Legion Magazine". 11 October 2010. ^ “Viola Bayley”, Rye Castle Museum website, 27 November 2012. ^ "Ancestry of Bob Marley". Wikivoyage has a travel guide for Rye.